Take a picture of receipt & the purchased MILO Beverage. Send to Whatsapp no. 017-383 6282, and must include Name, Contact no & Outlet name in the picture caption. 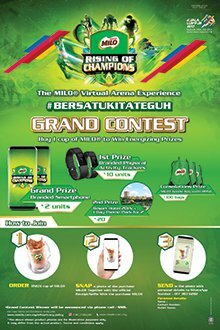 Visit MILO Rising of Champions Grand Contest terms & conditions for more details. Don't miss out: Machines Warehouse Clearance Sale! iPhone SE @ RM799 & more!